Our specialist range of Ethnic produce and Exotic produce has been air-freighted from all over the world in order to bring our clients only the freshest and most outstanding quality ethnic produce. These niche products are predominantly grown and imported from South America, the Caribbean, Africa, and the Indian Subcontinent. Please select a product from the small selection listed in order to learn more about this ever-growing category. 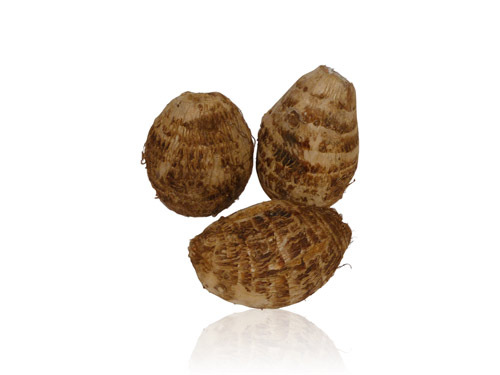 Arvi, also known as Taro, is a root vegetable from the same family as Eddoes and Dasheen. It is used much in the same way as a potato, and found regularly in ethnic stews and curries. The leaves of the arvi plant are called Alu Patra. Arvi is available year round from India and Pakistan. 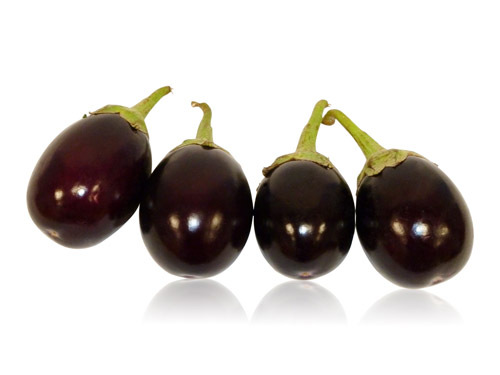 Our range of Black Beauty Aubergines are ideal for making Asian curries, providing a subtle sweet flavour. This variety has a low water content, allowing the texture of the flesh to remain firm. The sweetness stems from the minimal number of seeds the aubergine contains. 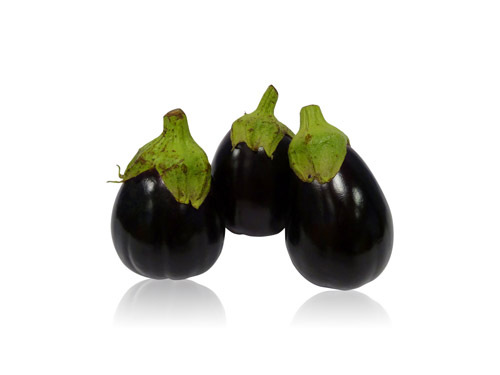 The distinctive flavoured Black Beauty aubergine is available year round from the Dominican Republic and Kenya. The graffiti aubergine is perhaps the most striking aubergine due to its twin colouration of deep purple with white stripes. It is often called the ‘Disco’ Aubergine. It has a tough skin making it ideal for roasting or frying. The aubergine is available year round. 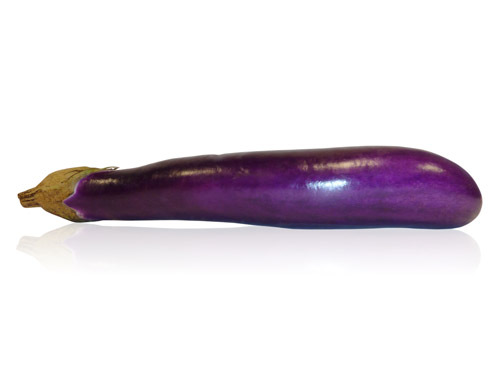 This Chinese Eggplant has a long, thin shape and distinctively purple colour. This variety is typically harvested when around 12 inches long, but retains the same flavour regardless of length or maturity. 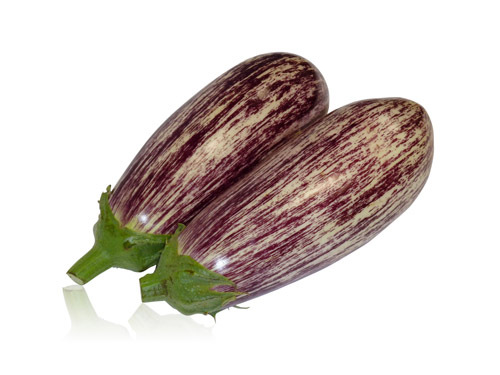 Long Aubergines have a sweet and mild flavour which is attributed to the lack of seeds it contains. Long Aubergines are available year round from the Dominican Republic and Mexico. This small round aubergine is great in curries as the skin is edible and so easy to prepare. The raw fruit can have a bitter taste, but becomes tender when cooked and develops a rich, complex flavour. These Baby Aubergines should be firm with a smooth skin. Avoid those with soft spots or brown patches. Pink Ravaiya is sourced year round from the Dominican Republic and Mexico, but is also available from Cyprus and Gambia. Red Indian Onions are available year round and have a strong distinctive flavour which can be enjoyed both raw and cooked. Cassava is the root of a tropical plant, cultivated as a rich source of carbohydrates. In many developing countries, cassava is used as a substitute to potatoes. Select cassava with tough brown skin which is often waxed. The flesh should be creamy white. Yellow flesh cassava tends to be much sweeter than the white flesh type. If prepared incorrectly, cassava may contain toxic cyanide residues. The most popular method of consuming this limited shelf life product is to make ‘chips’ from it. 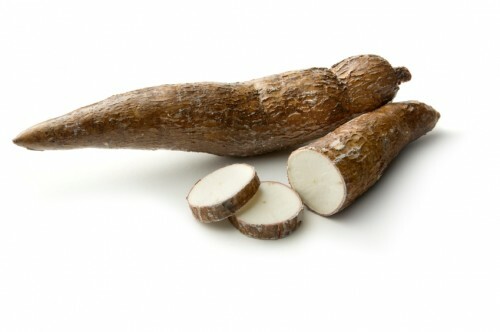 Cassava is available year round from a variety of sources including Costa Rica, Dominican Republic, Kenya, and Uganda. This gourd, which comes in a variety of shapes has a mild cucumber flavour, and can be enjoyed in much the same way as marrows. 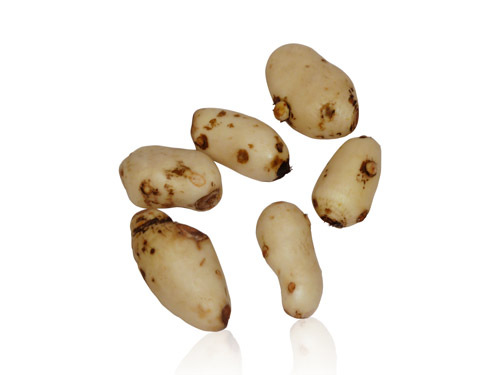 Select dudhi with silky smooth pale green skin. However, please do note that depending on variety, the skin colour can vary from pale green to cream. The skin texture may also be smooth or ridged. Avoid those which are soft at the ends. Dudhi can be used to prepare a variety of dishes, serving as a starter, main, and even dessert! Dudhi is available year round from the Dominican Republic, Gambia Mexico and India. Eddoes, which are popular in West African and Caribbean cooking, are small root vegetables with a slightly nuttier taste than potatoes. Select small firm eddoes. The rough brown skin should be removed before consumption. The peel of an eddo contains an irritant so care must be used when handling. Eddoes are available year round from Costa Rica. Despite its appearance, Garden Egg is a variety of small aubergine. It is available in various shapes and colours, but the most popular variant is the oval-egged shape white Garden Eggs. Fresh quality Garden Eggs are sourced from Ghana and Uganda. 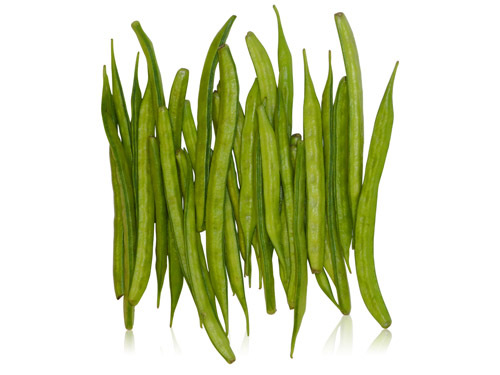 Chora, also known as Yard Long Beans, is a variety of Cowpea. It is a pencil-thin legume that resembles a green bean, although it can grow up to about 3 feet long. However, they are not usually found this long as only immature pods are selected as vegetables. The strong flavoured beans are not as sweet as a traditional green bean, nor as crispy, but the texture makes it perfect for stir-fries and curries. Green Chora is available year round from the Dominican Republic. 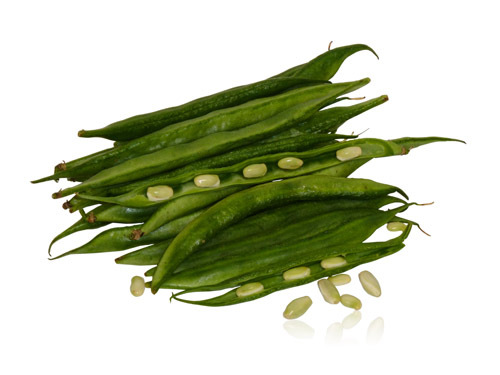 Guar is also known as cluster beans. This fine, flat green bean has a slightly bitter taste. Before cooking, guar is usually topped and tailed, and is kept chilled to maintain freshness. 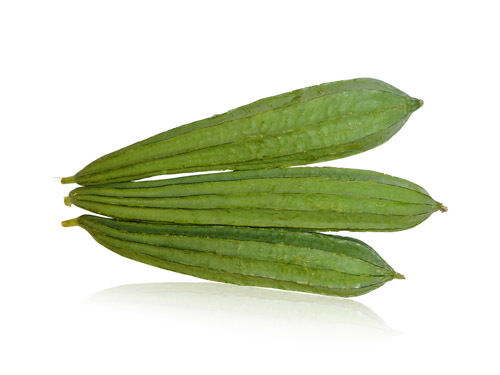 Guar is available year round from the Dominican Republic, Gambia and India. Bitter Gourd is a small dark green vegetable with bitter taste. The skin is covered with blunt tubercles. The Chinese variety is oblong and pale green in colour. Select firm green karelas with no visible signs of decay. Shades of pale green or yellowing on the ends are natural, and shows signs of ripening. Kareals can be enjoyed when both ripe and unripe. When karelas are green or turning yellow, the bitter flesh and tender skin are edible. As the fruit ripens, the skin and flesh become too bitter eat, but the central seeds and pith become sweet and turn from white to red. Karela is sourced year round from the Dominican Republic, the EU and Gambia. 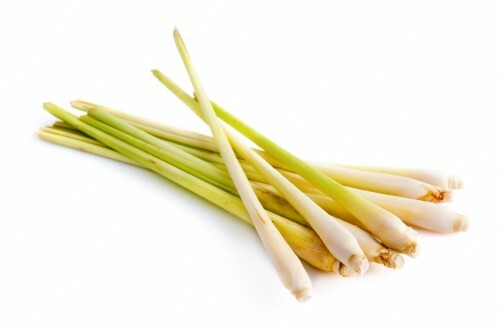 Lemon grass is typically used as a flavouring in Thai and Ethnic dishes, and has a sweet lemon fragrance. If using for flavouring, the whole stalk can be used. If using in food, only the bottom part is edible, and the top ‘wood’ like grass should be discarded. 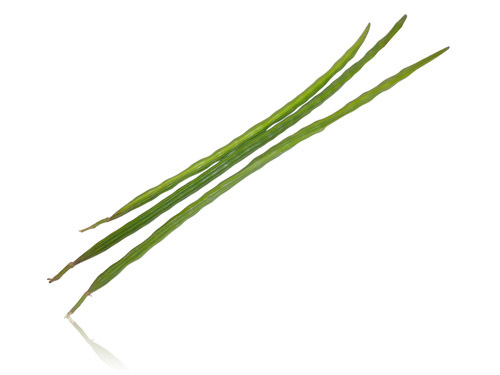 Fresh lemon grass is available year round from the Dominican Republic and Thailand. The stalks should be green in colour, firm, and feel heavy for their size. 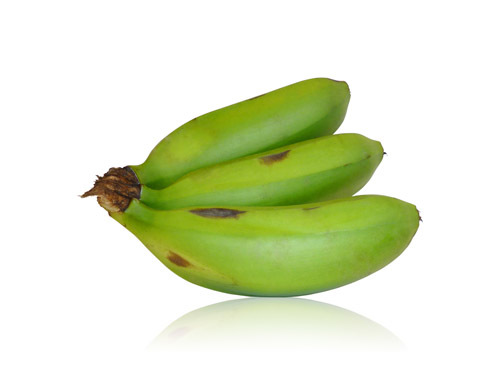 Matoke is a green, unripe banana variety that is popular in parts of Africa. It is always cooked before consumption as in the raw state it is too firm and starchy. As Matoke is cooked, the skins should peel away easily and the flesh may change from a white to slightly yellow colour. This is an indication of the starch being converted to sugars. Fresh Matoke is imported year round from Uganda. Fresh okra should snap cleanly under the thumb. Avoid those which bend as this shows a sign of age. 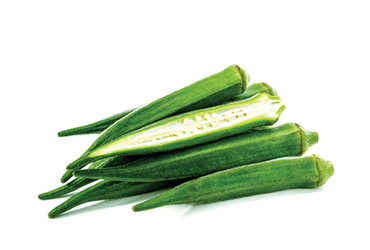 Fresh, crisp okra is available from India between November to May, and from Jordan between April and October. It is also sourced from Cyprus, Gambia, and Mexico. 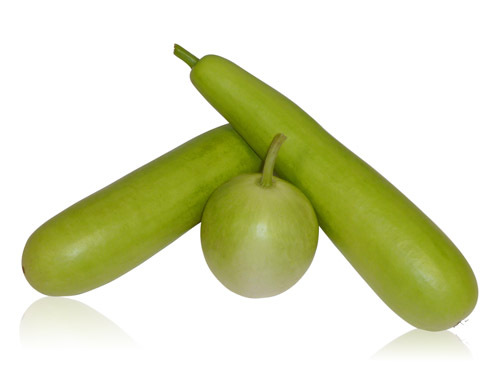 Raw green papaya is commonly used for making stir-frys and chutneys. It is also called Raw Paw Paw. Raw Papaya is available year round from the Dominican Republic. Papdi Surti is commonly known as the Hyacinth bean and is wholly edible. Much like mangetout, the entire pod may be consumed, or it can be shelled and the beans enjoyed in ethnic curries. Surti Papdi pods should be firm, smooth, and green in colour. The beans should be green and firm. Smaller size pods are favoured as these tend to be sweeter. Papdi is available most of the year from India and Kenya. Parwal is similar in appearance and taste to Tindori. It is also known as Pointed Gourd. Parwal can be either plain green or striped, but always select firm specimens. It is available year round from Dominican Republic. 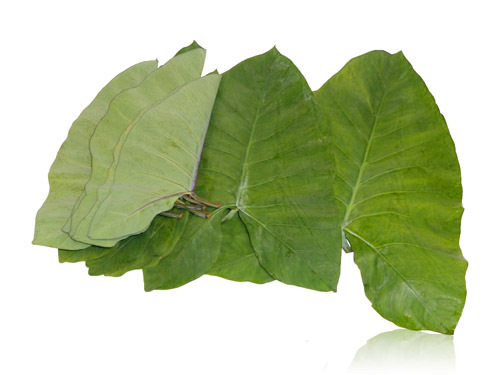 Patra is sourced from Dominican Republic and Kenya when best in season. Drumsticks are the unripe green pods of the Moringa tree. 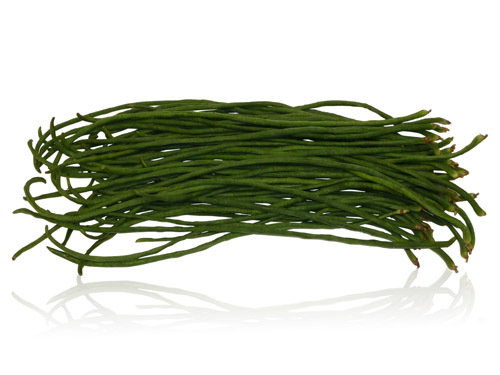 These long green ridged pods have a taste similar to asparagus, and are available year round from India. Select firm, rigid and green drumsticks. Expect slight bumps along the surface, which indicate the presence of seeds. Nutritionally, drumsticks are a great source of many vitamins and minerals including vitamin C and calcium. Tinda, which is from the same family as Dudhi and Tindori, is an apple-shaped squash. It has no distinctive aroma, but the flesh is very filling. 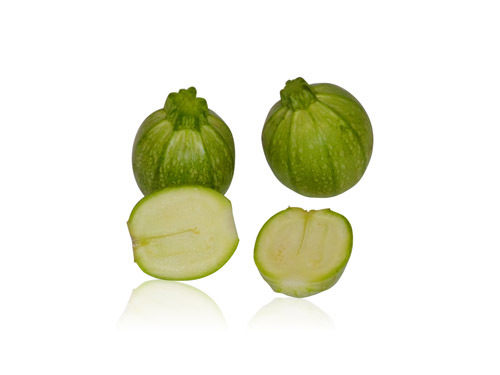 Tinda is sourced year round from Ghana, and is also available from India and Pakistan. 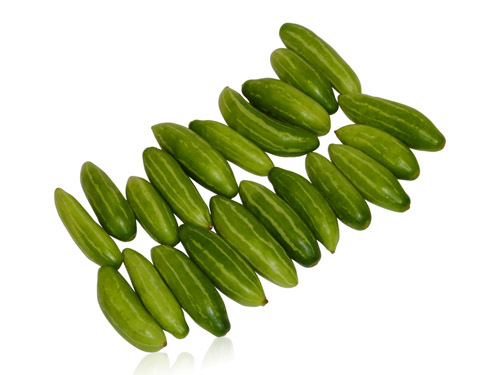 Tindori, which is an Ivy Gourd, is an elongated oval fruit which is similar in taste to a crunchy cucumber, but with a slightly bitter aftertaste. Select tindori which is firm and pale green in colour. Avoid those with a shade of orange or red as this indicates it is overripe. Refreshing tindori is available year round from the Dominican Republic and India. 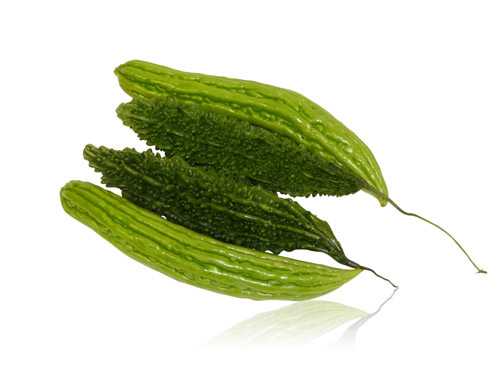 This vegetable, also known as Luffa or Chinese Okra, is harvested before maturity and resembles a ridged cucumber. The flesh has a creamy white and spongy texture. Select dark green coloured Turiya with a firm flesh. It is available year round from the Dominican Republic and Ghana.